Karma is a real thing, and here’s the evidence: Chimes rents 10 group homes in Northern Virginia where we provide residential services to adults with disabilities. As a good steward of its funder’s support, Chimes regularly assess the fair market value of the rents it pays. Dallison Veach is a Realtor® in Northern Virginia who has a very big heart. Dallison provided the assessments to Chimes as an in-kind service, saving the organization hundreds of dollars. Chimes is grateful for Dallison’s generosity, and we sent her a sincerely felt “thank you” note, which Dallison appreciated. Dallison is a member of the Board of Directors of the Northern Virginia Association of Realtors®, which has a charitable giving committee called NVAR Cares. 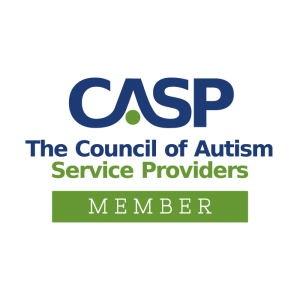 Dallison, also a member of this committee, introduced NVAR Cares and Chimes to one-another, and invited us to submit a grant for the committee’s consideration. 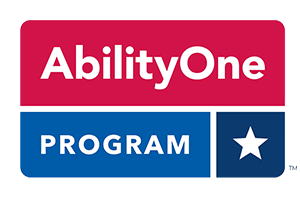 Meanwhile, the Northern Virginia chapter of the Knights of Columbus, a fraternal benefit society committed to helping individuals with disabilities, created a subsidiary non-profit, Marian Homes, whose mission involved the purchase and renovation of homes for use by individuals with disabilities. Five of the homes Chimes rents in Northern Virginia are Marian Homes, where rents are below market, and the homes are purposely built to accommodate the special needs of Chimes residential clients. The relationship between Chimes and Marian Homes is 20+ years strong, and not surprisingly, some of those first homes Marian Homes purchased and renovated are in need of further updates. 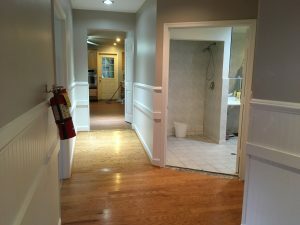 The home on Prestwick Avenue, which was built with wider than normal hallways to better accommodate wheelchair traffic, needed to have the hallway widened to accommodate a caregiver walking alongside the wheelchair. 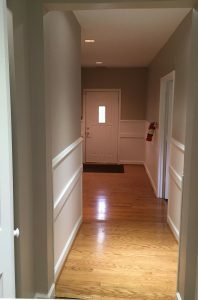 The cost of further expanding the hallway was several thousand dollars, and Chimes submitted a grant proposal to NVAR Cares to help cover the expense. Chimes Virginia’s Chief Operating Officer, Nancy Eisele attended the NVAR Cares meeting during which the grant request was discussed, sharing her passion for Chimes mission, and answering questions from the committee members. NVAR Cares awarded $1,000 to Chimes Virginia for its hall widening project, and Chimes once again, gladly, sent a sincerely felt “thank you” note. The amazing thing about this story is that all the principals are quick to deflect credit. Dallison and the rest of the NVAR Cares committee members don’t want any credit for their largesse; the Knights of Columbus and Marian Homes don’t want any credit for their beneficence; Nancy and her team don’t want any credit for selflessly serving the individuals in Chimes care. Karma. It’s a real thing.